Background Clostridium difficile infection (CDI) recurs after initial treatment in approximately one in four patients. A single-centre pilot study suggested that this could be reduced using ‘follow-on’ rifaximin treatment. We aimed to assess the efficacy of rifaximin treatment in preventing recurrence. Methods A multisite, parallel group, randomised, placebo controlled trial recruiting patients aged ≥18 years immediately after resolution of CDI through treatment with metronidazole or vancomycin. Participants received either rifaximin 400 mg three times a day for 2 weeks, reduced to 200 mg three times a day for a further 2 weeks or identical placebo. The primary endpoint was recurrence of CDI within 12 weeks of trial entry. Results Between December 2012 and March 2016, 151 participants were randomised to either rifaximin or placebo. Primary outcome data were available on 130. Mean age was 71.9 years (SD 15.3). Recurrence within 12 weeks was 29.5% (18/61) among participants allocated to placebo compared with 15.9% (11/69) among those allocated to rifaximin, a difference between groups of 13.7% (95% CI −28.1% to 0.7%, p=0.06). The risk ratio was 0.54 (95% CI 0.28 to 1.05, p=0.07). During 6-month safety follow-up, nine participants died in each group (12%). Adverse event rates were similar between groups. Conclusion While ‘follow-on’ rifaximin after CDI appeared to halve recurrence rate, we failed to reach our recruitment target in this group of frail elderly patients, so the estimated effect of rifaximin lacks precision. A meta-analysis including a previous trial suggests that rifaximin may be effective; however, further, larger confirmatory studies are needed. Recurrence after successful treatment of Clostridium difficile infection (CDI) occurs in approximately one in four patients. Patients are typically frail with multiple comorbidities. A pilot study suggested that a course of rifaximin after successful treatment might reduce recurrence by around 50%. Rifaximin ‘follow-on’ treatment 400 mg three times a day for 2 weeks, followed by 200 mg three times a day for 2 weeks, reduced recurrence by around 50%, but the 95% CI spans from 70% relative reduction to no effect. Meta-analysis suggests rifaximin ‘follow-on’ treatment is effective. Rifaximin could be a useful additional therapeutic option to reduce recurrence of CDI but larger studies would increase confidence in its use. The aim of the RAPID (RifAximin for the Prevention of recurrence following standard treatment of Infection with Clostridium Difficile) trial was to assess whether treatment with rifaximin after CDI resolution with standard therapy reduced the rate of CDI recurrence compared with placebo. RAPID was a multisite, two arm, parallel group, blinded, randomised, placebo controlled trial conducted in 23 secondary care hospitals in England with hospital microbiology services that also provided for the local community. The study was conducted in accordance with Good Clinical Practice guidelines and the provisions of the Declaration of Helsinki. The trial was prospectively registered on a public database: EU Clinical Trials Register EudraCT 2012-003205-10. Participants were recruited between 11 December 2012 and 7 March 2016. Those eligible for inclusion (see online supplementary file 1) were adults aged 18 years or older with a confirmed case of CDI that was successfully treated with metronidazole or vancomycin. This included primary, recurrent and multiply recurrent CDI episodes. CDI was defined as an episode of loose stools in the presence of a positive stool assay for glutamate dehydrogenase (GDH) and enzyme immunoassay for CDT with or without a positive C. difficile culture. Endoscopic evidence of pseudomembranous colitis could substitute for toxin positivity. In May 2014, the protocol was amended to remove the requirement for a GDH assay to reflect new guidance from Public Health England. Successful treatment for CDI was defined as cessation of diarrhoea for two or more days with no loose stools: stools that took the shape of a container, corresponding to type 6 or 7 on the Bristol Stool Form Scale. Participants were recruited from primary care through their general practitioner and secondary care through hospital research teams. Patients testing positive for C. difficile were identified through central laboratory testing. All participants with capacity gave written informed consent. Where prospective participants lacked capacity to give consent, consent could be given by a designated legal representative or an independent health advocate in accordance with Schedule 1 of the Medicines for Human Use (ClinicalTrials) Regulations 2004. Patients were randomised within 5 days of the last dose of standard therapy and were started the same day on the study drug which was continued for the next 4 weeks. Participants were randomly assigned in a 1:1 ratio to receive rifaximin or placebo. Randomisation was stratified by hospital and used a computer generated pseudorandom code, using random permuted blocks of randomly varying size. Site research teams allocated participants to a treatment using a secure, internet-based randomisation system developed and maintained by Nottingham Clinical Trials Unit, ensuring allocation concealment. Participants, clinicians, research nurses and the study team were blind to the allocated treatment as active and placebo tablets were packaged in matching deidentified treatment packs and dispensed by the hospital pharmacy. Participants were given 126 tablets, containing either rifaximin 200 mg or an identical placebo formulation. Rifaximin and placebo were supplied by Norgine Pharmaceuticals Limited as a gift and manufactured by Alfa Wassermann. The intended treatment regime was two tablets (400 mg rifaximin) taken three times a day for 14 days, reduced to one tablet (200 mg) three times a day for a further 14 days. Participants continued to receive standard care, including antibiotics for indications other than CDI, as determined by their physician. The number of tablets taken was assessed from the difference between the number of tablets supplied (126) and the number returned at the week 4 visit or earlier if CDI recurred. Since recurrences meant that participants took drug for a variable duration, compliance was assessed against the number of tablets expected to be taken by each participant at the end of their involvement. Participants with recurrence of CDI within 28 days of recruitment were asked to provide stool samples and withdrawn from trial treatment prior to commencing standard therapy at the local Principle Investigator’s discretion. Additional samples were also collected during any diarrhoea episode and for any recurrences occurring later after the start of treatment intervention up to 6 months follow-up. Participants attended study visits at 4 weeks and 12 weeks after the start of intervention, with telephone contact at 2 weeks, 8 weeks and 6 months to identify CDI recurrence and any serious adverse events (SAEs). In addition, patients were tagged in microbiology laboratory reporting systems and hospital administration systems to flag any CDI recurrence or hospital admission. Recruitment was slower than anticipated. Despite applying for and obtaining a further grant to fund a 12-month extension, we were unable to achieve our target recruitment by the time the trial was forced to close to follow-up in July 2016, when all funding ceased. An amendment to maximise numbers for the primary outcome was made, so any participants recruited after 10 December 2015 did not receive a 6-month telephone follow-up. For these participants, their last visit occurred at week 12, allowing determination of the primary outcome. The primary outcome was CDI recurrence within 12 weeks of randomisation. A recurrence was defined as three or more loose stools for two or more days in conjunction with a positive stool toxin assay. The primary outcome was determined by research nurses in each site confirming stool frequency with the study subject by direct questioning, together with the laboratory results. Secondary outcomes were: (1) recurrence of CDI within 6 months; (2) rehospitalisation for CDI within 6 months; (3) length of in-hospital stay following start of trial medication. We checked the hospital record of those who were lost to follow-up to ensure no further C. difficile infections or deaths were missed. Our initial intention to record stool frequency and consistency during the 4 weeks of treatment through daily stool diaries was made optional in June 2013 as we found early on that this requirement caused some patients to decline participation so these outcomes became exploratory. Similarly stool samples other than at the time of possible recurrence were made optional to maximise recruitment and retention. European Medicines Agency requirements for additional monitoring of the rifaximin formulation used in the trial mandated statutory reporting of all adverse events (AEs) even when such events are clinical endpoints in a trial. All AEs documented up to 30 days after the last dose of IMP were reported. For serious adverse events, including rehospitalisation due to CDI, the reporting window extended to final follow-up. Prior data indicated that the CDI recurrence rate among controls would be 30%. A clinically important difference was considered to be 20% (ie, 10% recurrence on rifaximin). To detect this difference with 80% power and two-sided 5% significance level (type I error) required 72 participants per arm (144 in total) using a two-group continuity corrected χ² test. The target sample size of 180 was chosen to allow for up to 20% non-collection of the primary outcome. Analyses were carried out using Stata/SE 13.1. All analyses were conducted according to allocated group (placebo or rifaximin) regardless of the amount of tablets actually taken. 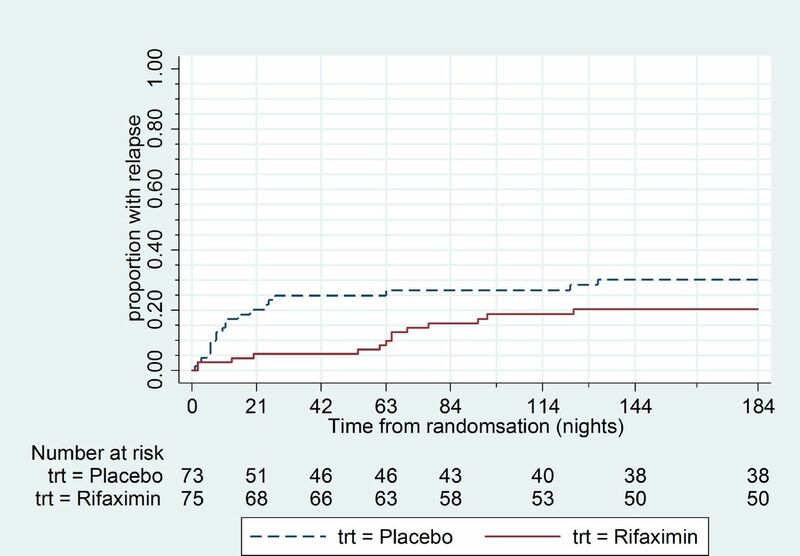 The primary analysis estimated the difference in percentage CDI recurrence between rifaximin and placebo groups at 12 weeks without imputation of missing outcome data. A generalised estimating equation was used with binomial family, identity link and an exchangeable correlation matrix to account for randomisation being stratified by hospital.33 The between-group estimate is presented as a risk difference with 95% CI and p value. The relative risk of CDI recurrence within 12 weeks is also presented (estimated using similar methods). Sensitivity analyses for the primary outcome were performed looking at the effect of missing data and compliance (see online supplementary file 3). A planned subgroup analysis for the primary outcome according to antibiotic use at baseline (metronidazole or vancomycin) was performed by including an interaction term in the primary analysis model. An additional posthoc analysis for the primary outcome according to history of CDI was also performed using the same methods. CDI recurrence at 6 months and rehospitalisation for CDI at 6 months were analysed using the same method as for the primary outcome. Length of stay was compared between the two groups using a Cox proportional hazards model. The time to first CDI recurrence is also presented using Kaplan-Meier survival curves. Participants who did not have a CDI recurrence are censored at date of death for participants who died, date of withdrawal for participants who withdrew consent and otherwise at 184 days (ie, 6 months) if randomised before the 10 December 2015 and 84 (ie, 12 weeks) if randomised after 10 December 2015. Adherence with trial treatment, other antibiotic use, AEs and stool frequency and consistency are presented descriptively. AEs were summarised according to date of onset: starting up to 28 days postrandomisation (ie, during the treatment period) and starting 29 days or more after randomisation. The Nottingham Digestive Diseases Centre Patient Advisory Group helped to prioritise the research question, plan the study and design all written material. A group delegate was a member of the Trial Steering Committee. A total of 2157 patients were screened across 23 hospitals. Of these, 151 were eligible, willing and randomised (7% of those screened) before funding limits were reached (74 placebo, 77 rifaximin). Approximately one-third of patients approached were not eligible for the trial and 20% declined to take part. The most common reasons given were competing comorbidities, perceived increase to treatment burden and personal demands of trial participation. Other reasons for exclusion reported were death or clinical judgement that the patient was too unwell. The target sample size of 180 was not met before the trial reached its funding limit and ceased recruitment in March 2016. The last follow-up visit occurred in July 2016. Participant flow through the trial is shown in figure 1. 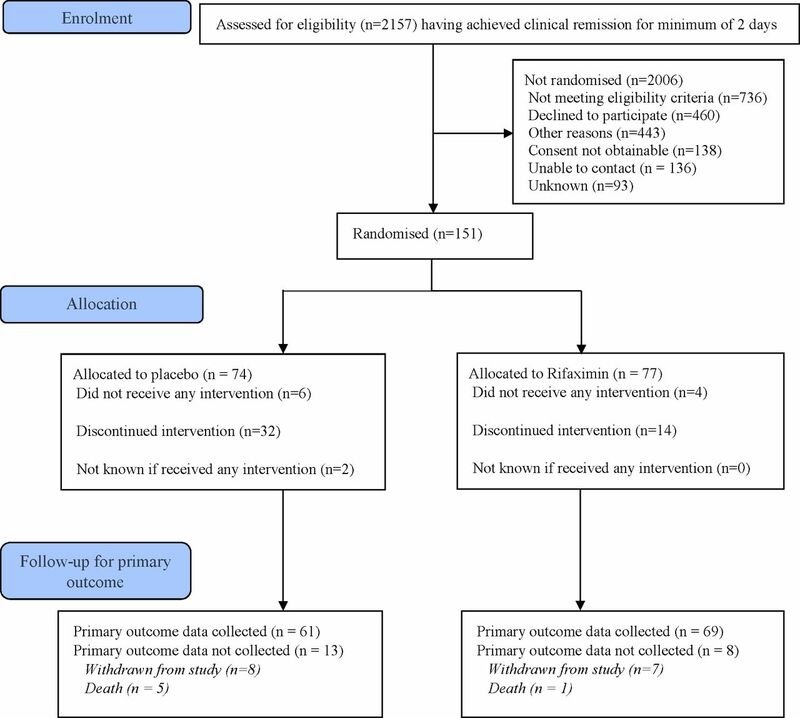 The primary outcome was available for 61 of the 74 participants randomised to the placebo group (82%) and 69 of the 77 participants randomised to the rifaximin group (90%). Fifteen participants withdrew consent and six participants died before primary outcome data could be collected. Baseline data are shown in table 1. The mean age of participants was 71.9 years and 118 participants (78%) were recruited at their first episode of CDI. The rifaximin group contained a slightly higher proportion of men, participants taking a proton pump inhibitor at randomisation, participants with a previous episode of CDI and participants recruited outside hospital. Just over a third of participants were inpatients when the trial treatment was started. Seventy-three participants (95%) in the rifaximin and 89% in the placebo group took at least one dose of trial medication. Median compliance was 97% (IQR 68%–100%) in the placebo arm and 100% (IQR 94–100) in the rifaximin arm (see online supplementary file 2). Eighteen of 61 participants (29.5%) on placebo had a recurrence of CDI within 12 weeks compared with 11 of 69 participants (15.9%) on rifaximin (table 2 and figure 2). The difference in risk of CDI recurrence within 12 weeks on rifaximin compared with placebo was −13.7% with 95% CI −28.1% to 0.7%, p=0.06 and risk ratio 0.54 (95% CI 0.28 to 1.05). Kaplan-Meier curves of time to CDI recurrence during trial. The figure shows most relapses in the rifaximin group occurred between 50 and 100 days. Recurrence in the placebo group mostly occurred earlier. CDI, Clostridium difficile infection. The results from the sensitivity analyses were similar to the primary analysis (online supplementary file 3): the difference in risk of CDI recurrence using multiple imputation for missing outcome data was −12.8% (95% CI −27.0% to 1.4%). Assuming all with missing data recurred gave a risk difference of −17.1% while assuming all with missing data did not recur gave a difference of −10.2% (see online supplementary file 3). There was no evidence of a differential treatment effect according to antibiotic used to treat the initial CDI or history of CDI (online supplementary file 4). At 6 months, the percentage of participants identified as having a CDI recurrence remained smaller in the rifaximin group but the magnitude of the difference in risk between the groups had reduced (table 3). Hospitalisation for CDI recurrence and length of inpatient stay for those participants who were inpatients at the start of treatment were similar in each group (table 3). Twenty-five out of 74 (34%) patients allocated to placebo and 23/77 (30%) allocated to rifaximin received further courses of antibiotics during the study. Of these, 26% (19/74) and 21% (16/77) were for indications other than treatment of recurrent CDI. There was no obvious difference in recurrence rate following antibiotic use in the two treatment groups but the numbers are too small to be meaningful. There were nine deaths reported on placebo and nine deaths on rifaximin. There were 15 (22%) participants with at least one SAE on placebo and 12 (16%) on rifaximin in the 28 days postrandomisation. No SAEs were considered to relate to the trial treatment in the group allocated to rifaximin. Non-SAEs in the 28 days postrandomisation were similar in the two groups but none were considered definitely related to rifaximin. Full details of types of AEs are provided in online supplementary files 5 and 6. Fifty six participants completed the patient experience questionnaire at 6 months. Barriers to taking part in the study identified by participants included difficulties completing the diary, collecting stool samples and taking the medication (size and quantity of tablets). At least one stool diary was completed by 75 participants (50%) during weeks one to four and by 48 participants (32%) in week 12. A summary of stool frequency and consistency during weeks 1 to 4 and weeks 11 to 12 is shown in online supplementary file 7. This is the second randomised, placebo controlled trial of ‘follow-on’ rifaximin treatment to prevent recurrence of C. difficile infection. Both trials included patients successfully treated with either metronidazole or vancomycin and both tested 4 weeks of rifaximin. The only difference was that in the current trial the rifaximin dose was tapered, using half the dose during the second 2-week period. However, the low absorption rate of rifaximin means that the stool concentration after standard doses exceeds the minimal inhibitory concentration (MIC) for C. difficile 160-fold34 so that halving the dose in the second 2 weeks would still provide stool concentrations well above the MIC. Combining the data increased confidence in a true difference in outcome, favouring rifaximin treatment. Data synthesis is based on summary results from both trials rather than individual patient data. The first trial had 39 participants randomised to rifaximin and 40 to placebo. Participants who did not take any doses were excluded from analysis giving 33 and 35 participants with data on the primary endpoint while the numbers in the analysis for RAPID did not exclude participants who did not take any trial treatment We found that, compared with placebo, follow-on rifaximin reduced absolute CDI recurrence rate at 12 weeks by 13.7% while the first trial27 reduced recurrence rate by 16%, giving an overall absolute reduction in risk of CDI recurrence of 14% (95% CI −26% to −3%), p=0.01 (see figure 3). Combined data from current and previous trial showing a significant difference favouring rifaximin treatment. The results of this trial are consistent with the earlier study27 suggesting that rifaximin treatment after resolution of C. difficile associated diarrhoea with standard therapy may reduce the risk of recurrence. However, like the earlier trial, the CI was wide and does not rule out no effect of rifaximin. Several studies have confirmed the underlying logic of the treatment showing that rifaximin does not alter the balance between commensal microbiota22 32 but does have significant activity against C. difficile. As figure 2 shows, the recurrences on placebo tended to occur rapidly, within the first few weeks, during which time those on rifaximin may have been protected from recurrence. A further course of antibiotics preceded recurrence in 9 out of the total 34 recurrences. Given the small number of cases, it is not possible to state definitively whether rifaximin was protective against such a recurrence. The reduction in recurrence rate we observed of 13.7% was less than the 20% we had assumed in our power calculations, which were in retrospect overoptimistic. However, it was similar to the reduction seen in trials of the monoclonal antibody bezlotoxumab as an adjunct to antibiotic therapy at primary treatment35 and in two large trials of fidaxomicin18 36 although in those trials fidaxomicin was used for primary treatment. It is worth noting that in a recent meta-analysis three out of five studies of fidaxomicin’s use in recurring disease concluded it was cost effective even though the observed reductions were only 8%–15%. A recent phase II trial found that primary treatment with ridinilazole, a novel antibiotic designed to avoid disturbance of the gut microbiota also reduced recurrence rate at 30 days to a similar degree.20 However, our trial recruited patients who had responded to initial standard therapy so may represent a different population. PPIs have been reported to increase recurrence rate, so it is important to note that patients on rifaximin by chance had a higher rate of PPI use, being 32% vs 20% in those on placebo which could have reduced the size of the reduction in recurrence rate we observed. Deaths, SAEs and AEs were similar to placebo suggesting that rifaximin is safe in this elderly, frail population. Challenges to recruiting this population have been reported elsewhere37 and made performing the trial difficult: we required 23 sites and screened over 2000 patients. The main reason for non-enrolment of those who met entry criteria was choice not to take part. This reflects the frailty and multiple comorbidities characteristic of patients with CDI whose infection has usually been induced by antibiotic treatment for another serious illness. Participants’ median (IQR) age of 76 (63, 83) with the oldest being 96, was higher than other trials cited. Mortality rate was also higher than in many trials of newer agents which tend to exclude the most frail. This suggests that, as we intended, by minimising the barriers to patient recruitment, we recruited a sample more typical of the patient group at risk of CDI, so our results should be generalisable to every day clinical practice. The main limitation of the trial is that the planned sample size was not achieved, resulting in reduced precision of the estimated treatment effect. However, combining our data with the earlier trial in a meta-analysis shows a significant reduction in CDI recurrence of around 50%. This provides some evidence for its efficacy but larger trials are needed before the true effect size can be accurately estimated. The authors would like to thank all those who supported the development and conduct of the trial and the participants who took part. Particular thanks also to co-applicants, Anthony Shonde and Nigel Minton; members of the independent trial steering committee Andy Cole (Chair), Graeme Maclennan (University of Aberdeen), Tim Bowling, Wendy Pratt and Janette Worley; and the Data Monitoring Committee (DMC) Nick Wight (Chair), Natalie Ives and Pradeep Sanghi. We would also like to thank Kevin Garey for his interest and support for a further meta-analysis and the trial sponsor, Angela Shone. The trial was sponsored by the University of Nottingham, was coordinated from the Nottingham Clinical Trials Unit and was supported by the National Institute for Health Research Clinical Research Network.
. Epidemiological and clinical profile of irritable bowel syndrome in India: report of the Indian Society of Gastroenterology Task Force. Indian J Gastroenterol 2008;27:22–8. Contributors All authors contributed to study design, trial management, analysis and write up. RCS, GM, AJ and MD conceived and designed the study and contributed to interpretation. LB and AM analysed the trial data and contributed to their interpretation. NB and KS managed the trial and contributed to data analysis and interpretation. All authors participated in the drafting, review and approval of the report and in the decision to submit for publication. Funding Trial protocol: https://www.nottingham.ac.uk/nctu/trials/gastrointestinal.aspx. The study was funded by the National Institute for Health Research (NIHR) through its Research for Patient Benefit (RfPB) programme, NIHR RfPB Grant PB-PG- 1010-23257. Trial drug and matched placebo were provided by Norgine without cost. National Institute for Health Research for Patient Benefit grant PB-PG-1010-23257. ISRCTN 65163992; EudraCT 2012-003205-10. Norgine supplied drug and placebo without charge. This is a summary of independent research funded by the National Institute for Health Research Nottingham Biomedical Research Centre. Disclaimer The views and opinions expressed herein are those of the authors and do not necessarily reflect those of the Research for Patient Benefit (RfPB) Programme, NIHR, NHS or the Department of Health. The corresponding author had final responsibility for the decision to submit for publication. Competing interests GM, LB, KS, MD, NB, AM, AJ, AS, NM declare no competing interests. RS received the IMP and matching placebo from Norgine Pharmaceuticals Ltd free of cost. Ethics approval National Research Ethics Service for England and the Medicines and Healthcare products Regulatory Agency. Data sharing statement Data sharing is available via Nottingham CTU. Collaborators Nottingham Clinical Trials Unit: Alan Montgomery, Professor of Medical Statistics and Clinical Trials; Lucy Bradshaw, Medical Statistician; Nafisa Boota, Trial Manager; Sarah Fahy, Trial Manager; Rob Allen, Trial Coordinator; John Watson Trial Administrator; Sarah Walker, Data Coordinator; Kirsty Sprange, Senior Trial Manager; Margo Childs, Senior Trial Manager; Gill Bumphrey, Trial Pharmacist; Daniel Simpkins, IT and Data Manager; Keith Whitaker, IT Programmer. Nottingham University Hospitals NHS Trust, Clinical Trials Pharmacy: Sheila Hodgson, Lead Pharmacist; Bernie Cook, Lead Pharmacy Technician and Lisa Humphries, Lead Pharmacy Technician. NIHR Biomedical Research Unit in Gastrointestinal and Liver Diseases: Melanie Lingaya, NDDC Technician; Yirga Falcone, NDDC Technician Microbiology: Dr Mathew Diggle; Patrick Budd; Tim Sloan; Jonna Jalanka; Emma Stevenson Recruiting Centres: Queens Medical Centre, Nottingham: Aida Jawhari, Saqib Ahmad, Helen Foreman, Jill Garratt, Shirley Pyke, Brian Rorison, Mina Patel. Kings Mill Hospital, Sutton-in-Ashfield: Anthony Shonde, Sam Kemp, Lynn Allsop, Alison Mossad, Cheryl Heeley, Nicholas Taylor, Sharat Misra, Stephen Foley, Lynn Wade, Rebecca Clarke, Rebecca Kewley, Sally Palmer, Samantha Boam, Steve Haigh, Yassar Hussain. Royal Derby Hospital, Derby: Alison Mossad, Charlotte Downes, Claire Grant, Elizabeth Barnes, Jessica Williams, Kerry Horne, Lindsey Kimber, Margaret Harper, Peter Fox, Ryan Humphries, Tracy Brear, Wendy Abbott, Sarah Craig, Farah Yazdani, Helen Forrest, Julia Lacey, Klara Garsed, Rebecca Turner. Northern General Hospital, Sheffield: John Hebden, John Humphreys, Joyce Fofie, Julie Sorrel, Kelsey Armitage, Kim Ryalls, Mark Davy, Michael Agyemang, Sarah Birchall, Stephen Booth, David Partridge, Jim Lithgow. Chesterfield Royal Hospital, Chesterfield: Amanda Whileman, Charlotte Adams-Heath, David Elphick, Emily Hall, Greg Naylor, Julie Toms, Keith Dear, Lesley Stevenson, Stephanie Wright. Royal Shrewsbury Hospital, Shrewsbury: Alison Baker, Angela Yeomans, Charlotte Owen, Colene Adams, Doyin Wilfred, Heather Button, Jeffery Butterworth, John Jones, Mandy Carnahan, Sharen Painter. Darlington Memorial Hospital, Darlington: Anjan Dhar, Anne Clark, Claire Shaw, Jill Deane, Lynsey Stevenson, Michelle Wood, Rebecca Henthorn, Richard Nendick, Anthony Kennedy, Penny Gamble, Rachel Burnip, Deepa Nayar. Sunderland Royal Hospital, Sunderland: David Hobday, Michelle Edwards, Pauline Oates, Roderick Beard, Chris Settle, Eleanor Dungla, James Crosbie, Jill Holden, John Painter, Leigh Richardson, Louise Fairle, Pauline Carr, Simon Cowlam, Stephan Butler. Kettering General Hospital, Kettering: Andrew Dixon, Debashish Das, Dhiren Bharkhada, Jeannie Kessell, Jemma Tate, Jo Novasg, Julie Fosbrook, Parizade Raymode. Dorset County Hospital, Dorset: Andrew Harris, Anthony Homer, Arabis Oglesby, Catherine Jeppesen, Dennise Maitland, Jackie Gibbins, Simon Wilshire, Emma Noyle, Gloria Moss, Pauline Ashcroft. James Cook University Hospital, Middlesborough: Agnieska Skotnicka, Andrea Boyce, Gill Wheater, Jane Thompson, Jason Wong, Julie Tregonning, Arvind Ramadas, Danielle Sweeney, Helen Dallal, Julie McGivern, Wendy Jackson. Cumberland Infirmary, Cumbria: Clare Hanson, Chris Brewer, Clive Graham, Emily Hetherington, Hannah Crowther, Helen Fairlamb, Sarah Thronthwaite, Toni Wilson, Una Poultney, Anna Mcskeane, Elena Crucerson. Basingstoke Hospital, Basingstoke: Barbara King, Carley Merritt, Caroline Palmer, Christina Narh, Claire Williams, Mariam Ashrafi, Matthew Brown, Megan Topping, Sophia Stanford, Linda Swanson. North Hampshire Hospital, Hampshire: David Lloyd, Duncan Cooke, Johanna Hellstrom, John Gordon, Julie Elliott, Karen Gamble, Markus Gwiggner, Matthew Brown, Victoria Croome, Angela Frith. University Hospitals NHS Foundation Trust, Southampton: Cheryl Booker, Darren Ball, Emma Levell, Michelle Smith, Mike Stroud, Miranda Kean, Monica Fenn, Suranda Dharmasiri, ,Violetia Razanskaite, Meirion Ford, Rasha Said, Tracey Day, Graeme Jones, Julie Mitchell, Yazmin Bitouche. New Cross Hospital, Wolverhampton: Clare Hammond, Gurminder Sahota, Helen Steed, Jayne Rankin, Jaynesh Patel, Kelly Kauldhar, Marie Green, Matthew Reid, Michael Cooper. Doncaster Royal Infirmary, Doncaster: Anurag Agrawal, Gavin Hill, Helen Foot, Jane Dumville, Mark Fairweather, Nicola Lancaster, Sarah Hone, Thelma Commey. Russells Hall Hospital, Dudley: Clare Allcock, Jacqueline Smith, Lakshimpriya Mohankumar, Ranjit Gidda, Sauid Ishaq, Susan Merotra, Danielle Stacey. Stepping Hill Hospital, Stockport: Dave Das, Emma Taylor, Gail Foley, Janette Curtis, Lucy Orrell, Maureen Holland, Moira Taylor, Sarah Scanlon, Susan Graham, Zahid Mahmood. Queens Hospital, Romford: Parveen Dugh, Pranab Gyawali, Salina Tsui, Theresa McClusky, WanTei Wiseman, Butwana Rommel, Meera Patel, Purushothaman Premchand, Kevin Spencer, Rob Davis, Sacha Goodye. Kings College Hospital, London: Anisur Rahman, Eric Witele, Gaynor Notcheva, Guy Chung-Faye, Joanna Flanagan, Kirandip Mandar, Lee Meng Choong, Oluwafunmilayo Adedeji, Surabhi Tashi. Correction notice This article has been corrected since it published Online First. An error in the Meta-analysis paragraph has been corrected.